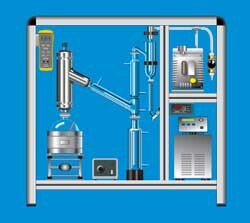 B/R offers 3 levels of automation for vacuum distillation apparatus according to ASTM D1160. Fully automatic control of the vacuum distillation process eliminates operator attention. 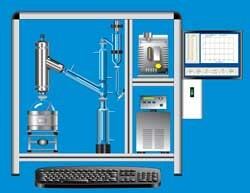 Vacuum level, distillation rate, condenser heating and so forth are automatically controlled. The operator sets the parameters and starts the program. 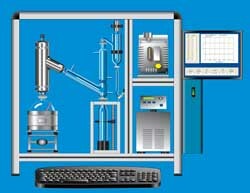 Distillation data are automatically stored on the computer. Friendly computer control screens makes operating this D1160 easy. Semi Automatic D1160 This unique semi automatic D1160 takes some of the guess work out of running a D1160 while still being reasonably priced. This model offers automatic vacuum control as well as heating control. This model is perfect for labs with limited budgets or moderate sample loads. The semi automatic D1160 can be upgraded to a fully automatic D1160 at any time. Manually Operated D1160 This manually operated D1160 is a turn-key vacuum distillation system including everthing needed to distill a sample. The support structure is open and ergonomic to help make the distillation go more smoothly. Safety shields offer additional protection for the operator. Finally, there is a manually operated D1160 that works well and looks good. This model is a good option for labs with limited budgets or small sample loads.